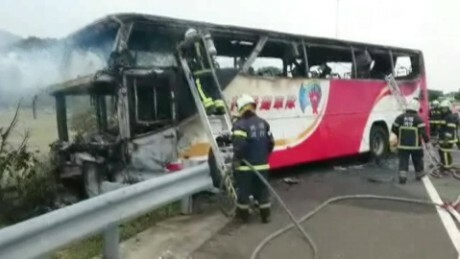 (CNN) At least 26 people have been killed in a tour bus fire after it crashed into a guardrail on a highway near Taoyuan International Airport, according to the Ministry of the Interior’s National Fire Agency. The crash occurred just before 1 p.m. local time on the No. 2 National Freeway that serves the capital Taipei’s airport, CNA reported. The bus was westbound on the highway and headed for the airport, where the tour group was due to fly back home after seven days in the country. The Taoyuan City fire department deployed 23 vehicles and 60firefighters to join the firefighting and rescue operation. After extinguishing the fire, the crew reported finding a number of burned bodies.